Jiménez Alés R, Sánchez Fuentes IC. Dilemmas in the care of children whose families refuse vaccination. Rev Pediatr Aten Primaria. 2018;20:83-93. The CJUE Ruling of June 21, 2017: nothing new beyond the stir associated with the "anti-vaccine debate"
Ojuelos Gómez FJ. The CJUE Ruling of June 21, 2017: nothing new beyond the stir associated with the "anti-vaccine debate". Rev Pediatr Aten Primaria. 2017;19:e133-e140. Molina Martín E, Arroba Basanta ML. New regulation of clinical essays using pharmaceuticals in Spain. Rev Pediatr Aten Primaria. 2016;18:e229-e237. Merino Villeneuve I. A new vaccine: vaccine for self-knowledge. Neurobiological base of human behavior. The game between the instintive-emocional brain and the rational brain. Rev Pediatr Aten Primaria. 2016;70:e85-e91. Basulto J, Ojuelos Gómez FJ, Baladia E, Manera M. Sugars in infant food. Spanish and European regulations, who are they protecting? Rev Pediatr Aten Primaria. 2016;69:e47-e53. Merino Villeneuve I. A new vaccine! The vaccine of self-knowledge. Self-knowledge through neuroscience self-knowledge, emotional intelligence and the mindfulness. Rev Pediatr Aten Primaria. 2015;17:e289-e293. Benito Orejas JI, Garrido Redondo M, Velasco Vicente JV, Mata Jorge M, Bachiller Luque R, Ramírez Cano B. Extraction of wax from the ear. Rev Pediatr Aten Primaria. 2015;17:e223-e-231. Villalba Nogales J. Coping with the death of a child: pediatric palliative care from Primary Care. Rev Pediatr Aten Primaria. 2015;17:171-83. 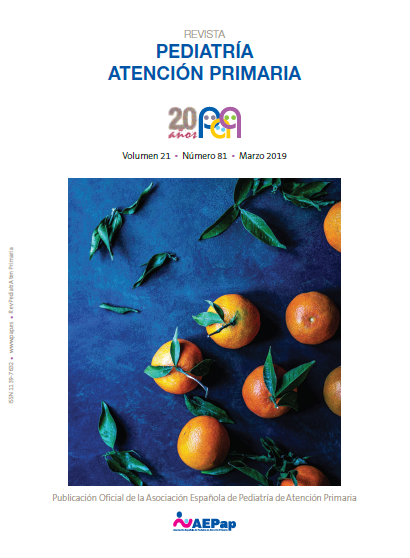 Ortiz Soto P, Duelo Marcos M, Escribano Ceruelo E. The psychiatric interview to children and adolescents (III): psychopathological and structural assessment of the child. Rev Pediatr Aten Primaria. 2015;17:e69-e82. Clinical ultrasound: a diagnostic test or a part of the routine exam? Sánchez Ferrer FJ, González de Caldas Marchal R, Schneider S. Clinical ultrasound: a diagnostic test or a part of the routine exam? Rev Pediatr Aten Primaria. 2014;16:361-5. Cabanyes Truffino J. Fetal behavior: a window to neurodevelopment and early diagnosis. Rev Pediatr Aten Primaria. 2014;16:251.e101-e110. Ortiz de Lejarazu Leonardo R, Tamames Gómez S. Flu and flu vaccines. Present and Future. Rev Pediatr Aten Primaria. 2014;16:253-8. Madrid L, Lanaspa M, Bassat Orellana Q. Biomarkers for the screening of pediatric infectious diseases: A true diagnostic revolution for the developing world. Rev Pediatr Aten Primaria. 2014;16:259-64. Alegria Coll I. Conceptual and socioeconomic differences on poverty. Rev Pediatr Aten Primaria. 2014;16:265-74. Corretger Rauet JM, en representación del Comité Asesor de Vacunas de la AEP. Vaccinations in children with Down syndrome. Rev Pediatr Aten Primaria. 2014;16:159-67. Ruiz Lázaro PJ, Rodríguez Gómez T, Martínez Prádanos A, Núñez Marín E, en representación de la Comisión de Coordinación del proyecto “Creciendo con atención y consciencia plena”. Mindfulness in Pediatrics: The “Growing with mindfulness” project. Rev Pediatr Aten Primaria. 2014;16:169-79. Cazorla González JJ, Cornellá i Canals J. Possibilities of physical therapy in the multidisciplinary treatment of autism. Rev Pediatr Aten Primaria. 2014;16:85.e37-e46. Lorenzo Bartolini's Beneficenze, allegory of Pediatrics? Madrigal Díez C, Madrigal Díez V. Lorenzo Bartolini's Beneficenze, allegory of Pediatrics? Rev Pediatr Aten Primaria. 2013;15:274.e115-e118. Armero Pedreira P, Bernardino Cuesta B, Bonet de Luna C. Bullying. Rev Pediatr Aten Primaria. 2011;13:661-70. Bonet de Luna C, Fernández García M, Chamón Parra M. Depression, anxiety and divorce in childhood. Practical aspects for the busy pediatrician. Rev Pediatr Aten Primaria. 2011;13:471-89. Bonet de Luna C, Marín JL. Disease, normality or “children on demand”; reflecting in Paidopsychiatry. Rev Pediatr Aten Primaria. 2011;13:321-31. Rico Vales T, Herencia Solano C, García Martín A, González Castro S, Puyol Buil PJ, Torres Mohedas J. A preterm infants’ follow up program from the therapeutical and educative point of view. Rev Pediatr Aten Primaria. 2010;12:e1-e19. Morell Sixto ME, Martínez González C, Quintana Gómez JL. Disease mongering, the profitable business of diseases’ promotion. Rev Pediatr Aten Primaria. 2009;11:491-512. Grupo de Trabajo CS-IHAN, Hernández Aguilar MT, González Lombide E, Bustinduy Bascarán A, Arana Argüelles-Cañedo C, Martínez-Herrera Merino B, et al. Health Centres IHAN (Initiative for a more Human Birth and Lactation Care). A quality assurance. Rev Pediatr Aten Primaria. 2009;11:513-29. San José Montano B. Open access, a necessary model of scientific communication. Rev Pediatr Aten Primaria. 2009;11:299-311. Valdivielso Ramos M, Mauleón Fernández C, Balbín Carrero E, de la Cueva Dobao P, Chavarría Mur E, Hernanz Hermosa JM. Photo protection in children. Rev Pediatr Aten Primaria. 2009;11:313-24. Ruiz Lázaro PJ. Two tools to interview adolescents: the motivacional interview and the sanitary-social participative advice. Rev Pediatr Aten Primaria. 2009;11:155-9. Foster care, justice or solidarity? Martínez González C. Foster care, justice or solidarity? Rev Pediatr Aten Primaria. 2008;10:703-10. Navarro FA. Glossary of doubts and difficulties English-Spanish for paediatricians (second part: J-Z). Rev Pediatr Aten Primaria. 2008;10:e1-e23. Navarro FA. Glossary of doubts and difficulties English Spanish for paediatricians (1st part: A-I). Rev Pediatr Aten Primaria. 2008;10:317-38. Merino Moína M, Bravo Toledo R. Web 2.0: another way of being in the Internet. Rev Pediatr Aten Primaria. 2008;10:339-55. Navarro FA. Medical prescriptions for our sick language (part 1). Rev Pediatr Aten Primaria. 2008;10:141-59.
del Villar Rubín S. How can we achieve together a safer Internet for our minors. Rev Pediatr Aten Primaria. 2007;9:485-99. Marín Aparicio M, García Martín A. Early Attention program and coordination in the town of Móstoles (Madrid). Rev Pediatr Aten Primaria. 2007;9:317-28. Burrueco Arjona J. The consequences of education “on demand”. Rev Pediatr Aten Primaria. 2007;9:291-9. González Luque JC. Children injuries by traffic accidents in Spain: the magnitude of a preventable problem. Rev Pediatr Aten Primaria. 2007;9:133-47. Mateu Sancho J. Children and road security. Rev Pediatr Aten Primaria. 2007;9:113-31. Alonso Peña D, Redondo Pardo UL, Alonso Peña J, Zaragoza Fernández M. Prominent ears in a Primary Care office. Rev Pediatr Aten Primaria. 2006;8:671-8. Pérez Pedraza P, Salmerón López T. Communication and language development: indicators of concern. Rev Pediatr Aten Primaria. 2006;8:679-93. Acosta Navas B, Muñoz Hiraldo ME. Emergency postcoital contraception. Rev Pediatr Aten Primaria. 2005;8:523-30. Zamarra San Joaquín MP. Key ideas to develop health education on affectivity and sexuality. Educating for life. Rev Pediatr Aten Primaria. 2006;8:505-21. García Castro MT. Diagnosis of dental malocclusions in Primary Care. Rev Pediatr Aten Primaria. Rev Pediatr Aten Primaria. 2006;8:295-317. Bassat Orellana Q, Guinovart Florensa C, Alonso Fernández PL. Malaria in the world. What needs to know a paediatricians? (I): historic perspective, aetiology, epidemiology, pathogenesis and clinical symptoms. Rev Pediatr Aten Primaria. 2005;7:641-657. Fernández Navarro JM, Pozuelo B, Ortí P, López L, Verdeguer A, Castel V. Relation of the Pediatric Oncology Unit with Primary Care: the role of the home care unit. Rev Pediatr Aten Primaria. 2005;7:481-488. Ruiz Lázaro PJ, Bosques Castilla D, Cózar López G, González Santiago B. Adolescent´s health promotion in Primary Care: Alcalá de Henares model. Rev Pediatr Aten Primaria. 2005;7:451-461. Bravo Acuña J, Merino Moína M. AEPap web page, a rising value. Rev Pediatr Aten Primaria. 2004;6:639-648.
de Aranzabal Agudo M. International cooperation in children health care (Second part). Strategies in developing countries. Rev Pediatr Aten Primaria. 2004;6:475-491. Gómez de Arriba A. Starvation, do still exists? Malnutrition in the new millennium. A forth-standing challenge. Rev Pediatr Aten Primaria. 2004;6:249-261. Uranga N. Access to essential drugs: a right of all. Rev Pediatr Aten Primaria. 2004;6:263-269. Cirera Viladot A, Ustero Alonso P. Present situation of third world AIDS. Rev Pediatr Aten Primaria. 2004;6:271-275.
de Aranzabal Agudo M. International cooperation in childhood health (first part). Causes and determinants of health in developing countries. Rev Pediatr Aten Primaria. 2004;6:277-290. Katz M. Community Pediatrics (first level and ambulatory) in Europe: realities and reflections. Rev Pediatr Aten Primaria. 2004;6:291-294.
del Campo Sánchez A. Detection of sexual abuse of minors: definition, prevalence, indicators and risk factors. Rev Pediatr Aten Primaria. 2003;5:629-641. Muñoz Garrido V. The school in social risk situations and abuse. Rev Pediatr Aten Primaria. 2003;5:447-458. García Izquierdo F, López Benito MM, Nuño Mateo F. The importance of deciduous teeth. Their chronology of eruption. Rev Pediatr Aten Primaria. 2003;5:439-445. Benítez Rubio MR, Medranda de Lázaro MI, Pizarro Hernández C. Contraception in adolescence. Rev Pediatr Aten Primaria. 2003;5:273-298. Star anise, a safe medical herb? Madurga Sanz M. Star anise, a safe medical herb? Rev Pediatr Aten Primaria. 2002;4:657-666. Suárez P, Ortiz P, Ayala Curiel J. Sleep in infancy. Rev Pediatr Aten Primaria. 2002;4:639-655. Antequera Vinagre JM. The child in Sanitary Assistance: intimacy and informed consent. Rev Pediatr Aten Primaria. 2002;4:495-504. Burrueco Arjona J. First bonds (in life and in medical settings). Rev Pediatr Aten Primaria. 2002;4:505-514. Sterilization of the disabled. Rev Pediatr Aten Primaria. 2002;4:301-309. Galán Gómez E. Medical genetics. Past, present and future. Rev Pediatr Aten Primaria. 2002;4:291-300. Chacón Castillo M, Ballesteros Massó R, González Pérez M. Sport preparticipation assessment (II). Rev Pediatr Aten Primaria. 2002;4:123-138. Peñalver I, Santana R, Cuevas N, Olmos A. Identification and actualisation of children in social risk population (15 years experience). Rev Pediatr Aten Primaria. 2001;3:627-638. Chacón Castillo M, Ballesteros Massó R, González Pérez M. Sport preparticipation assessment (I). Rev Pediatr Aten Primaria. 2001;3:639-652.
de Miguel Martínez MT. The Early Intervention. First levels of detection and investigation. Rev Pediatr Aten Primaria. 2001;3:471-480. Santos de Soto CJ. Past, present and future of Pediatric Cardiology. Rev Pediatr Aten Primaria. 2001;3:459-469. García Lorente MA. The protection to children in situations of risk and misprotection: actions from the sanitary field. Rev Pediatr Aten Primaria. 2001;3:275-282. Gómez de la Cámara A. Investigation in clinic and epidemiological fields of pediatrics. Rev Pediatr Aten Primaria. 2001;3:101-118. Gutiérrez Díez MP, Millán de las Heras MJ. Knowing child abuse in the medical setting. Harmful performance in Primary Care. Rev Pediatr Aten Primaria. 2000;2:609-628. Peñalva Soto MA. Human genome and medicine. Rev Pediatr Aten Primaria. 2000;2:445-463. Transgenic foods: danger or benefit? Ramón D. Transgenic foods: danger or benefit? Rev Pediatr Aten Primaria. 2000;2:277-288. García-Camba E. Feeding behaviour disturbances today. Rev Pediatr Aten Primaria. 2000;2:101-136. Axelson I. Evidence based medicine in practice: to treat or not to treat otitis media. Rev Pediatr Aten Primaria. 1999;1:629-637. Taracena del Piñal B. The generalist pediatrician and the house physician in their first approach to the adolescent. Rev Pediatr Aten Primaria. 1999;1:639-644. Avellanosa Caro I. Child and adolescent mental health in Spain. Rev Pediatr Aten Primaria. 1999;1:467-475. Martín Zurro A. PAPPS (1988-1999) Programme of Preventive and Health Promoting Activities. Rev Pediatr Aten Primaria. 1999;1:303-308. Salmerón García F. Vaccinations. Between science and marketing. Rev Pediatr Aten Primaria. 1999;1:289-301. Nogales Espert A. The future of childrens nutrition. Rev Pediatr Aten Primaria. 1999;1:113-122. Taracena del Piñal B. Pediatrician training in Spain during the last fifty years. Rev Pediatr Aten Primaria. 1999;1:109-112.